Imagery is where the director supposedly began, coming up with two of the film's most shocking and violent scenes, and working backwards from there to come up with a story to frame those two scenes. Normally this sort of creative process lends itself to poorly fleshed out characters and narrative, but somehow the opposite is true here. The characters in Hereditary are the reason this film is as effective as it is. In particular, Annie (played by Toni Collette in what will undoubtedly be her most famous role), and Peter (played by Alex Wolff), bring the horror of their situation to life by their performances, and by the depths of their characters and the arcs that they go through. Some criticism has been leveled against the movie for a first half that is mostly family drama and not horror, and the fact that it only truly ramps itself up in the final quarter. To me, this is the strength of the film, that we spend so much time with our characters and so much time empathizing with the plight of this family and the strange circumstances that surround them, that the supernatural terror they experience seems to bizarrely be an extension of the unsettlingly real tragedies they live through. Annie and Peter both get two key scenes in which they have to process and react to unbelievable, spine-chilling horror, with the difference between the scenes being that only one of them is grounded in the supernatural. The harshness and cruelty of reality is taken to it's extremes here, to an extent that is almost painful to watch. I will try to avoid real spoilers, but I will say that watching Annie scream and cry in agony and sorrow, with Peter laying in his bed right down the hall, frozen by fear and regret, is something that is going to stick with me just as much as some of the more "horror" elements of the movie. These characters aren't just actors in a scary set-piece like you might see with some of the more generic movies of this genre that get pumped out by Hollywood, these are people, people with motivations and histories and fears that all get used to their fullest potential. This is a movie that can only work as well as it does on the back of great character-building. The second major reason that the scares in this movie works as well as it does comes down to a single word: courage. Popular horror franchises often get dismissed and mocked for their use of "jump scares", moments that are fairly simple to accomplish as they generally just involve creeping the audience out, then playing some loud music and tossing a scary face onto the screen. Hereditary, as far as I can remember, features essentially zero of these moments, and instead asks us as the audience to stare directly into the face of fear. There are surprising moments in the movie for sure, and there are some smash cuts which suddenly show us something frightening, but for the most part these aren't used to cause us to jump, they're used to force us to confront something, or to reveal something horrifying. The way that "courage" comes into play here, is that I believe it took a lot of guys for the director to simply present some of these images without dressing them up. A lot of "jump scare" moments essentially stem from the lack of faith in the filmmakers ability to actually scare the audience, so they fall back on something that they know will work, loudly surprising us to get some sort of reaction. Hereditary instead chooses to simply show us things without comment, and trusts in it's ability to scare us. So many scenes throughout involve no music and no quick camera movements, instead lingering in one spot and forcing us to confront what we're seeing. This causes a very real feeling of unease, as it gives the audience absolutely no reprieve. There are no convenient cutaways to give us a moment to catch our breath, we are not allowed to avert our gaze from the evil that we are confronted with. The use of lighting as well, especially in the final few scenes, is extraordinary. The darkness covering the house feels oppressive and otherworldly, elevating these scenes to a level not seen as of yet in the film. Over the course of writing this review I've gone to sleep every night making myself remember key moments from the film, and in a strange way it makes me want to watch it again. The mastery involved in crafting these moments, and presenting them in such a bold, unwavering way, I can't help but admire it. It's gut-wrenching in it's emotional intensity and it's willingness to dig down into true evil (in that way it reminds me of The Wailing, a fantastic Korean horror movie), and despite the tumultuous feelings associated with watching something like that, it's level of quality and artistic control is extremely admirable. This raises a question that I've been asking myself to consider for most of this week: why do we watch movies like this? Why do we willingly confront ourselves with images that burn themselves into our mind and then go out and tell people how fantastic it is? I think in Hereditary, the director Ari Aster has helped answer this question for us. It's a difficult topic that I'm not fully equipped to answer to the satisfaction of skeptics, but at it's core I believe the reason we do this to ourselves is for art, and for the exploration of our minds. 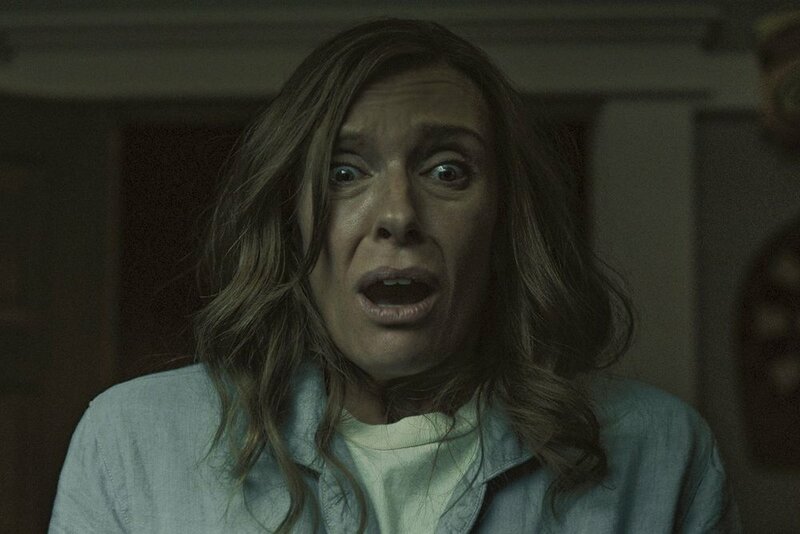 Films like Hereditary are different than conventional scary movies, which are generally meant to excite and thrill, to entertain for a few hours. This movie is meant to confront us with emotional pain that is nearly unimaginable in it's scope, and I believe that it is in it's own way, a challenge for audiences, for filmmakers, and for us as people. Plenty of movies attempt to do this, but often times the end result looks like something being edgy for the sake of being edgy, and ends up having bare bones characterization, poor direction, and no plot. To prove that art made at the edges of what is considered acceptable should be considered valid, it has to be, yknow, good. Now Ari Aster is no Lars Von Trier, there is nothing truly challenging here, but I think that the high level of quality displayed in this movie makes up for that. The craftsmanship seen at every level, from the writing to the acting to the direction, shows that horror is a genre worthy of being created by genius-level talent. It's a little early to give that high of praise to Aster, since this is his first feature-length film, but the amount of restraint shown here, in addition to the incredible quality of the entire work, lands him a position as someone to really be watching out for. This is a film that is meant less for the genre-connoisseur, and more for the discerning eye. True horror fans will find plenty to love in Hereditary, but I believe it's more of a continuation of a trend of horror being crafted with care, and being treated as something more than the end to it's own means. It Follows, Get Out, and A Quiet Place are all new, widely loved horror films created by directors not known for horror. What does this mean exactly? I believe that Hereditary will be placed high among the ranks of this new renaissance of horror, especially considering it falls much more squarely into true, supernatural levels of horror than some of it's other, more subtle counterparts do. Will Hereditary however take it's place among all time horror classics? Will it one day be spoken of with reverence in the same way that Rosemary's Baby and The Exorcist are? Only time will tell. Generally horror fans are quick to crown new champions, and every new movie that comes along gets comparisons drawn to those classics. I believe Hereditary has a higher chance of actually becoming a classic than others of it's kind have, but it's impossible to know. Perhaps we still have yet to see the best that this new trend has to offer, or maybe with this film, we're seeing the peak of artistic achievement in the genre that this decade has to offer.